There are 4270 posts in this topic. You are on page 31 of 86. I am running version 1.10. I think I remember that setting came in the later versions. ok thanks. I prob will make the switch. I also just bought cliffys for the shooter lane but after reading instructions it seems like more work than I was expecting. drilling a hole? anyone know how to reduce the magnasling power ? There seemed to be some confusion. 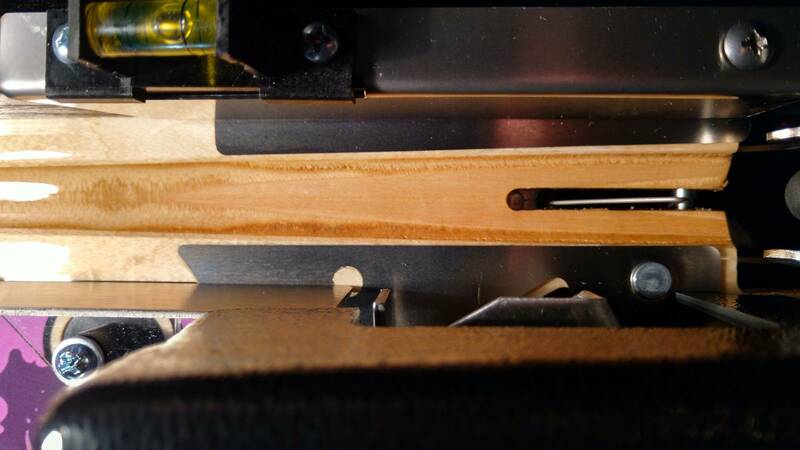 According to the manual the 'Eject VUK' (Vertical Up Kick) coil is what causes the chipping in the shooting lane. The coil power can be adjusted in the service menu ADJ > G.B. > Feature Adjustment #11 - Trough Eject Power. Mine is set the lowest power 176. This helped a bit, but I have also installed a cliffy protector. The other issue is the 'Auto Launch Assembly' firing way too hard. 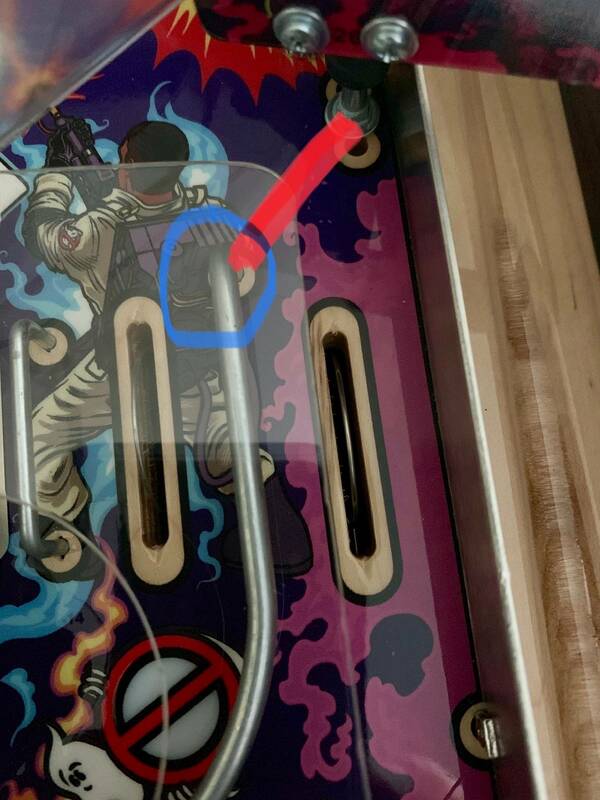 I was worried that is was going to crack the plastic on the back as most of the time the ball ricocheted off the wall into Stay Puft or came bouncing back down the shooting lane. This is what the replacement spring fix is for. Easy to replace. 2. Compress spring to raise up the coil off the coil stop. 3. Rotate everything out of the way, replace the spring, and reassemble. Have not read the whole thread so unsure if this has been mentioned. 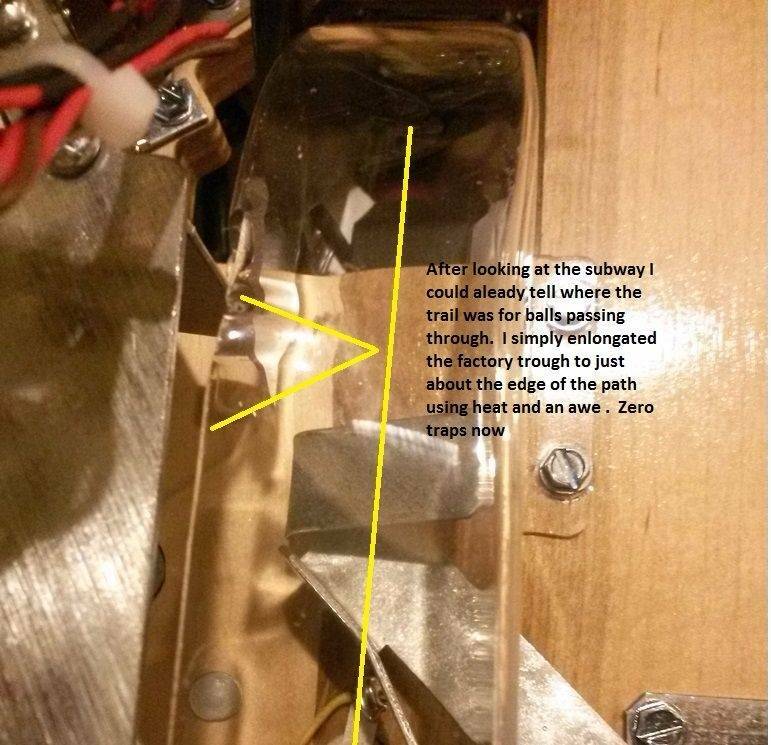 Has anyone experienced the ball being stuck in the subway? 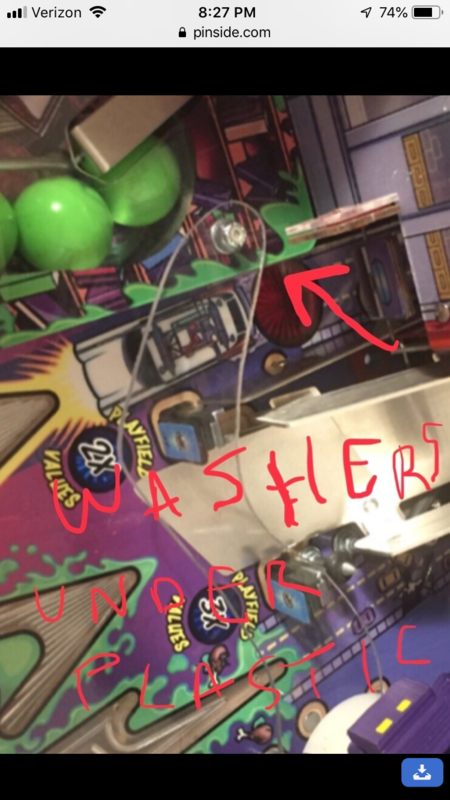 About three or four times this week (only received the machine this week) the ball goes missing in the subway and the machine can't find it. It gets stuck at the very bottom of the ramp half way into a gateway where the ball goes when it is locked. 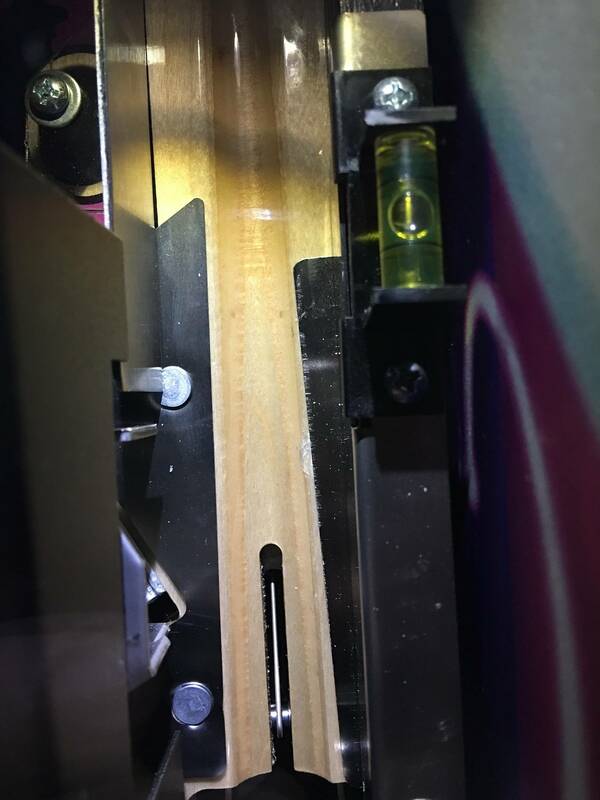 I have to turn the machine off, remove the glass and stick a long screw driver down into the subway exit and push the ball into the lock gateway. Keeps ruining my games. Have tried tilting to get it to drop into the lock but it takes a little bit of effort / jiggling with the screwdriver to push the ball into the lock. 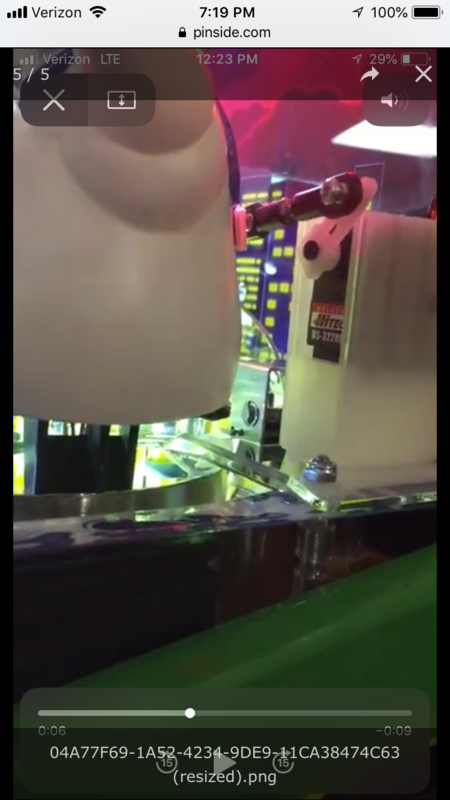 I then turn the machine on and the ball gets kicked out to the flippers and I have to start a new game. Use the word "subway" in the "Find Posts In This Topic" function at the top of the page, there are a few posts on it. 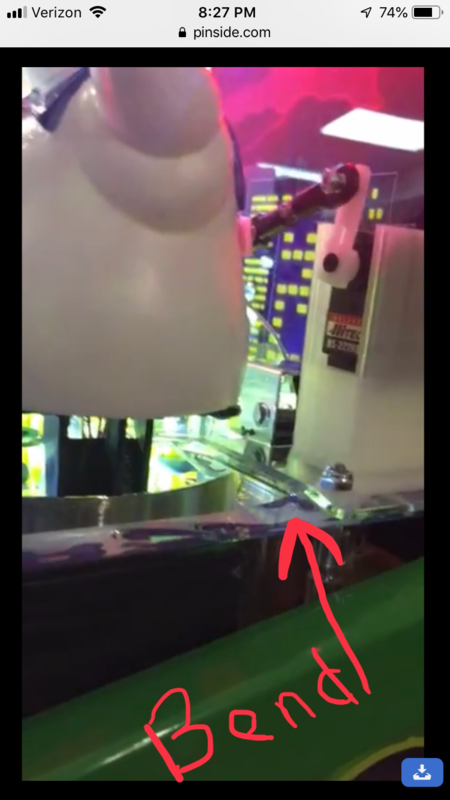 About three or four times this week (only received the machine this week) the ball goes missing in the subway and the machine can't find it. It gets stuck at the very bottom of the ramp half way into a gateway where the ball goes when it is locked. This happened to my machine. 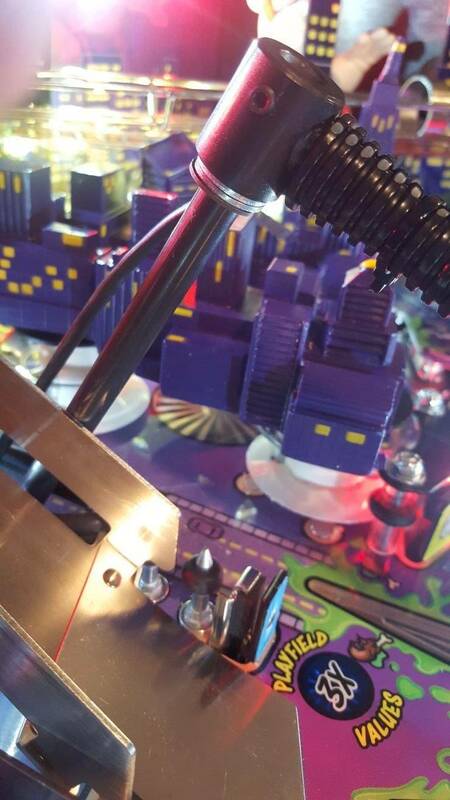 First be sure the playfield is level left to right. Once level is verified and the condition is still there; this fix is not for a novice. If you overheat the subway it will warp. You will note that the exit side of the subway has a makeshift add on divot which looks like someone made with a hot flat head screwdriver. Problem is they did not take the divot to the middle of the subway. That divots job is to promote ball movement toward the metal ball lock assembly. 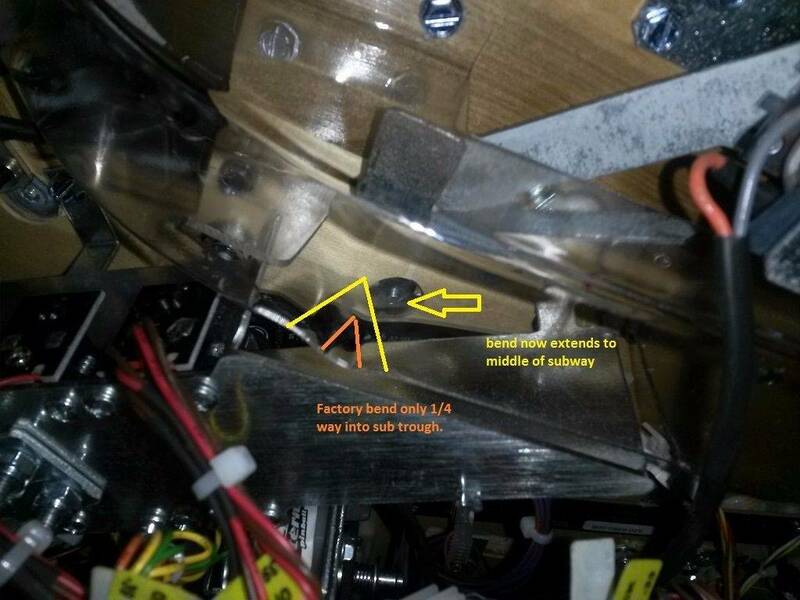 I removed the six hex head screws to allow movement of the plastic ramp without taking it out of the machine. I warmed my ramp at the divot point only and once it was flexible I used an awe to make the exit divot extend to the center. I used an awe because it has a fine tip and tapers outward as it gets closer to the handle. I marked the center of the plastic ramp with a sharpie so I knew where to stop. 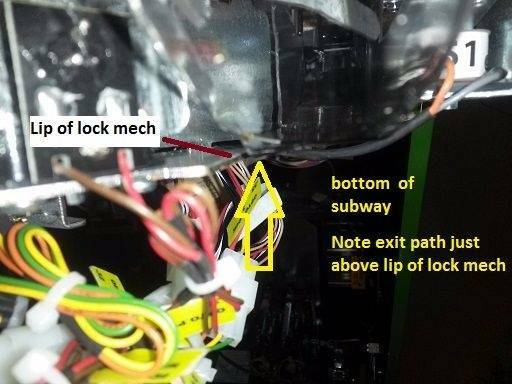 Be careful making sure the lowest point of the plastic subway is above the top surface edge of the metal ball lock assembly. 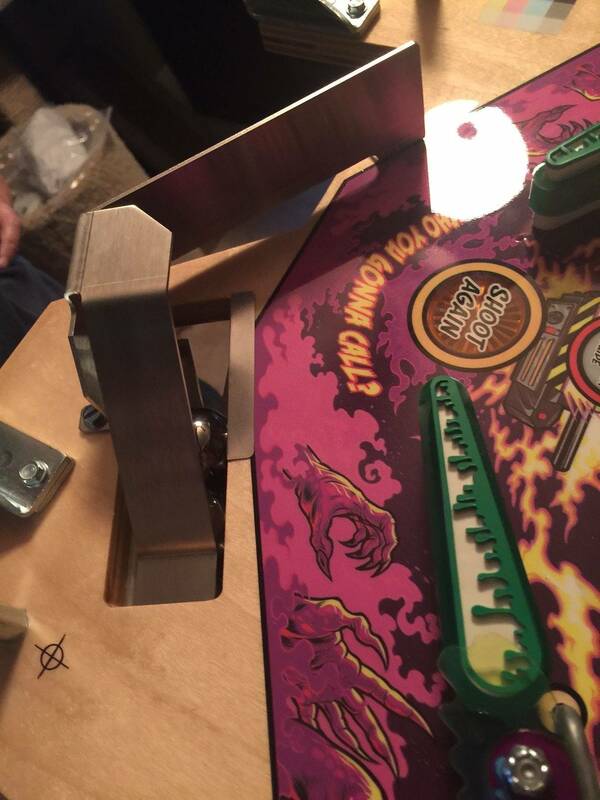 If the plastic ramp exit area is below the metal edge the ball will still trap. This took me warming up the ramp twice to get it right. Twenty games in and zero stuck balls. Seems Stern identified the issue and just didnt take the fix all the way to the center as needed. I just used the hole the leveler is in so I didn't have to drill anything. My leveler is now "off" so I don't use it to level the game. Can you post some pictures? I didn't see a divot at all on mine, would be interested to see what you did. Also, my understanding is if the ball isn't supposed to be stopped for mode start/locked, it should just pop out of the subway with no problem. If it doesn't make it out of the subway, then it should be diverted into the lock and ejected out of the scoop. 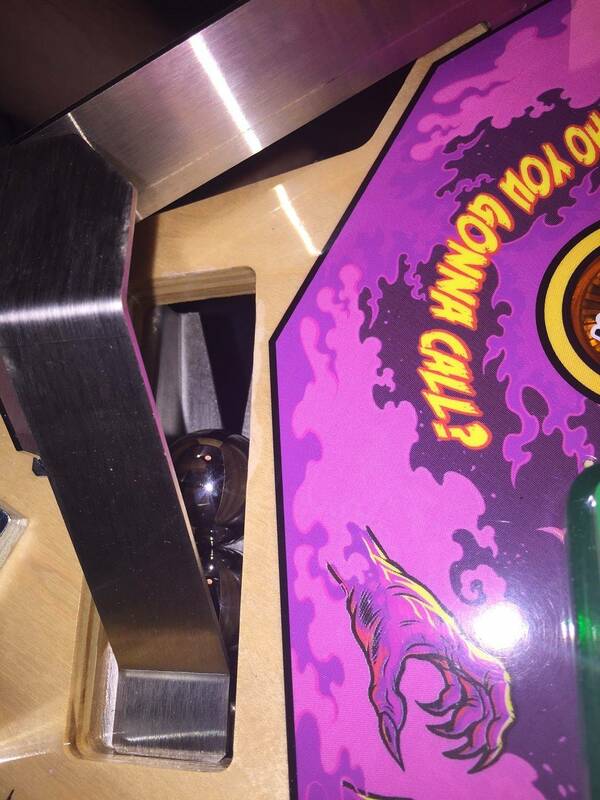 Multiball double shots or more to the subway you will get stuck balls and balls dribbled in. There is no way to stop that. When a ball gets trapped in there it will go down the metal shoot and kick out of the upkick. Can somebody post a pic of their finished cliffy shooter Lane? Just want to see what the end product looks like. Already I have a very very minor wear in the switch area of the shooter Lane although i don't think cliffys cover that. 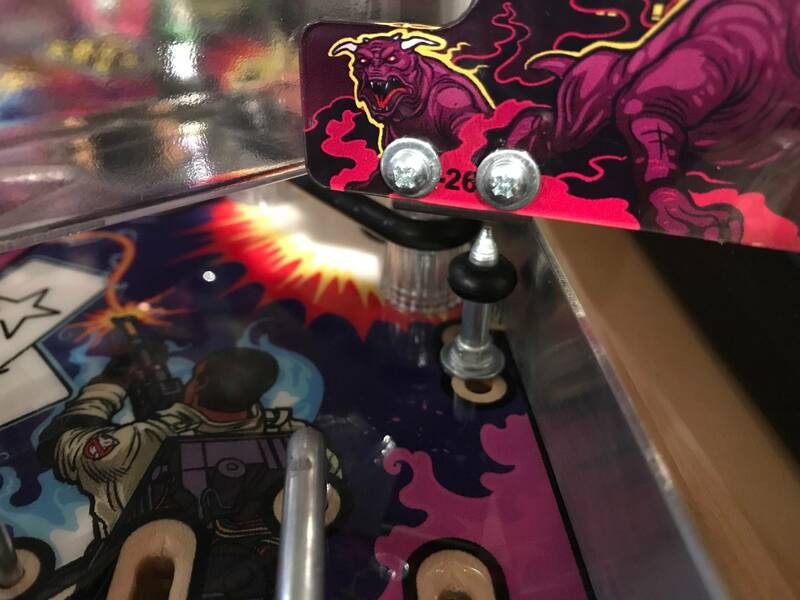 Can somebody post a pic of their finished cliffy shooter Lane? I used the cliffy although I just mounted to one of the headless bolts on the left side. Also the left side protector shape prevented a perfect alignment with the lane but it does the job. I have had my GB LE for about 2 weeks now. Just guessing but it probably had been played around 100 games. Its been reset since or I would check the counter. 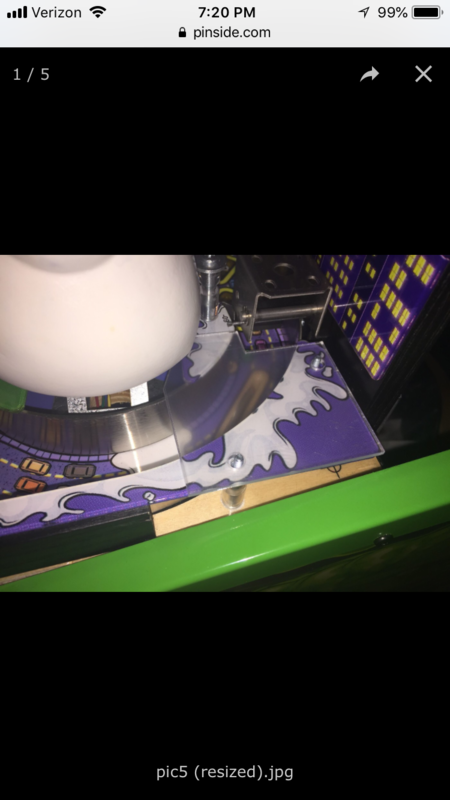 As I posted in the spikes issues thread, my machine came DOA. Stern and I narrowed it down to a bad cpu. Replaced that and all was operational. 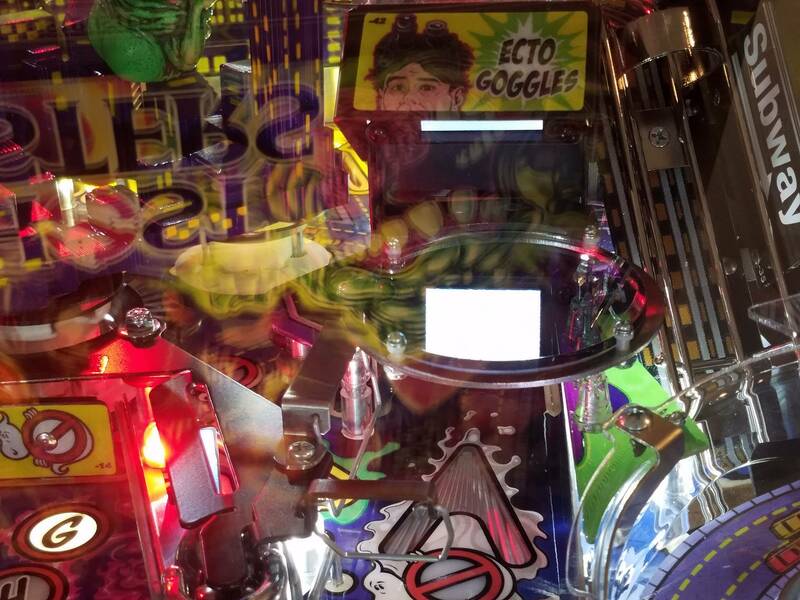 A few days ago the ecto goggle had a major malfunction. My wife and I were playing the night before without any problems. Switched it on the next afternoon and noticed the image on the goggle started up blank white. Played a round and actuated the hologram. Instead of your usual projected ghost animation, it just rapidly rotated through every ghost in its memory bank. Received replacement board today, installed and functions normal. Yay! 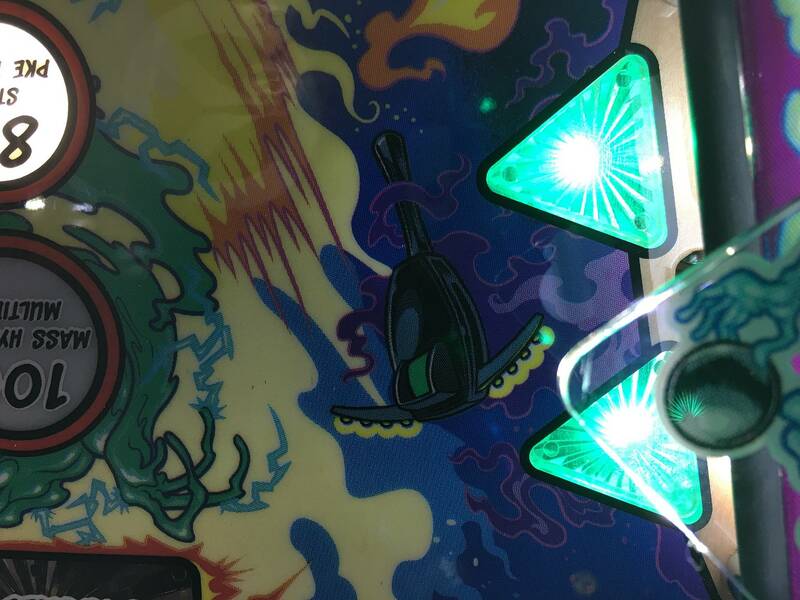 Also, after a few members mentioned ghosting on their playfields I checked mine and sure enough I can see separation on Tobins, Super Jackpot, and on a couple other lights. Despite these problems I have nothing bad to say about Sterns customer service. They were patient, very responsive to returning my calls and obliged my request to expidite replacement parts. Its a bit dissapointing though to buy 1 of 500 machines and have to deal with the kind of problems we are experiencing. It seems to me to be a quality control problem. Possibly these units aren't being tested as vigorously as they should be before being shipped. Just a thought. 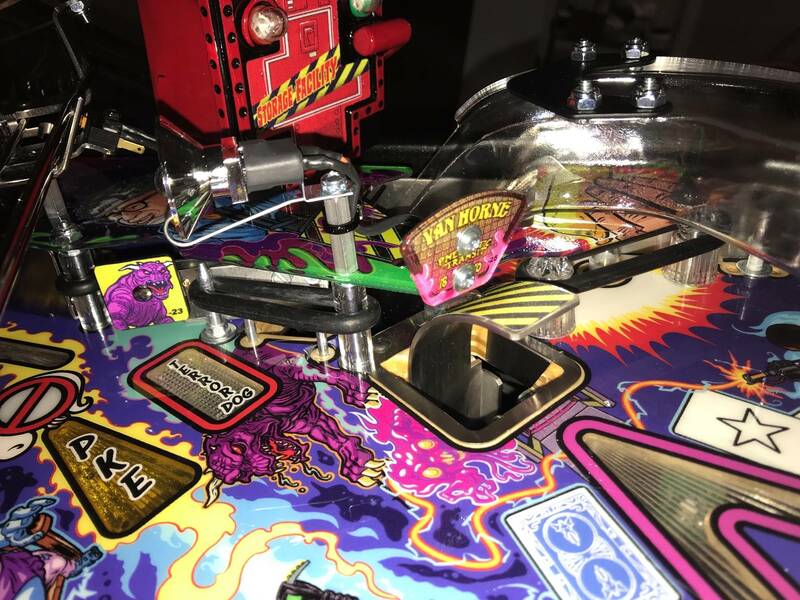 Its for sure one of the funnest pinball games I have played in a while. I had this same problem. It lasted for a couple days then stopped. 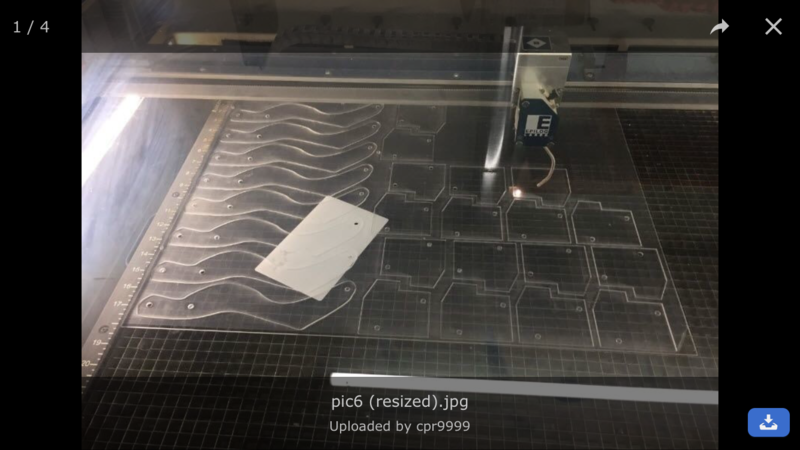 Maybe there is a real ghost in the machine. I was going to call stern but it hasn't come back. Finally found green electrical tape and did this, what a great improvement, now I'm not getting blinded. I also did the lightning bolt shaped flasher too. Very happy with the difference. Hi Guys, I may be on to something here: Look at the attached pictures. They were taken under the same light conditions with the same camera at the same time (10 seconds apart). The colors are very different. In one the overalls are brownish, in the other more green. This is in real life also the case. The more brownish one does have ghosting (look at Tobins) and the greener has not. Overall the one with the greener overalls does have much better colors such as the blues and the purples. 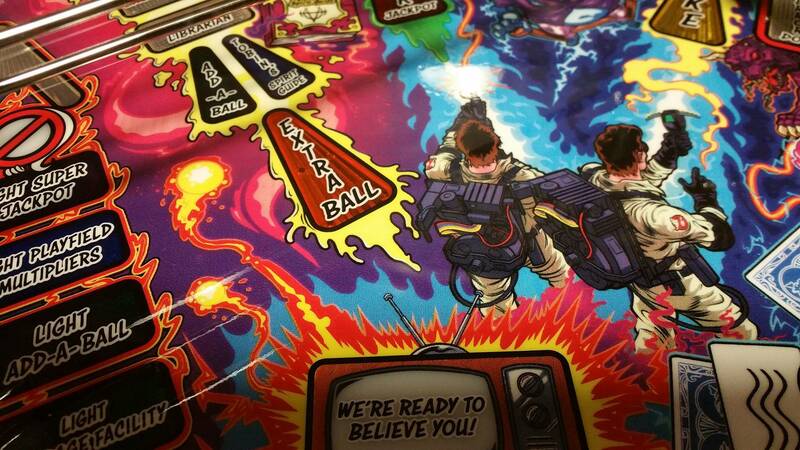 The other playfield looks more washed out when looking at it directly. Wow! 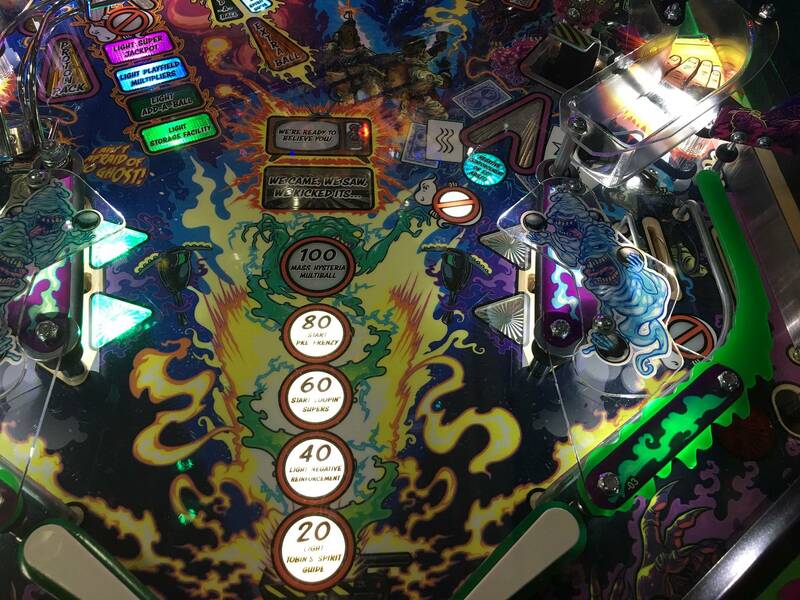 Yeah i definitely have the more washed out looking playfield, and mine has a lot of "ghosting" as well. The color difference between the 2 is amazing! My overalls look brown, but colors seem quite rich and no ghosting. Over 1000 plays so far. GB Premium. Late Sept build date. Maybe we can confirm this is the same for all playfields that are having ghosting ? Subway fix. Basically extending the factory divot to just about the center of the subway ball travel area. Hope this helps. Again if you overheat the ramp its toast so only attempt if you feel your skill level is there. I cant figure out how to remove the slimer mech to add a washer to raise my slimer. 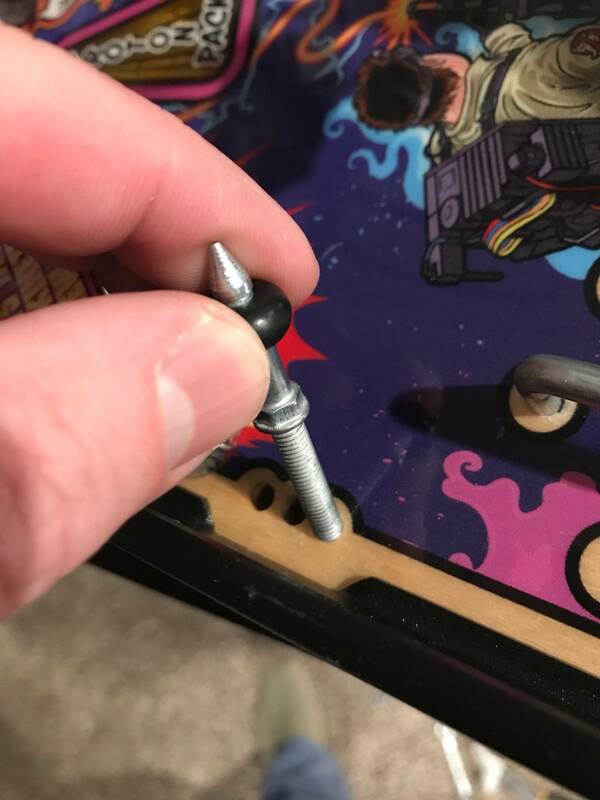 I understand its a grub screw yet how do you get this off? Has anyone posted a video of doing it? what tools do you use? It's a Allen head set screw. just give it one or two turns. I had to adjust one of them to drop flush from factory... I do notice they don't drop very good yet I haven't put many plays on my game as I just set it up yesterday. 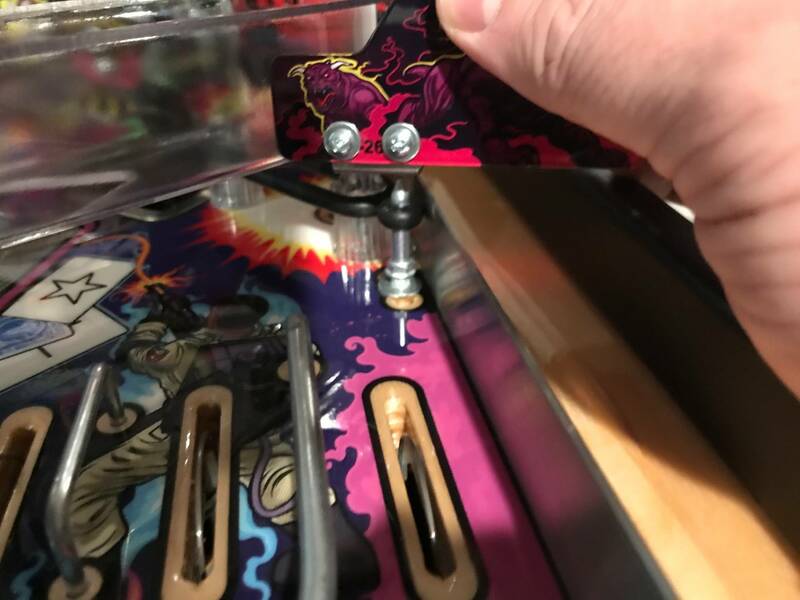 I've tried the springs from pinballlife. 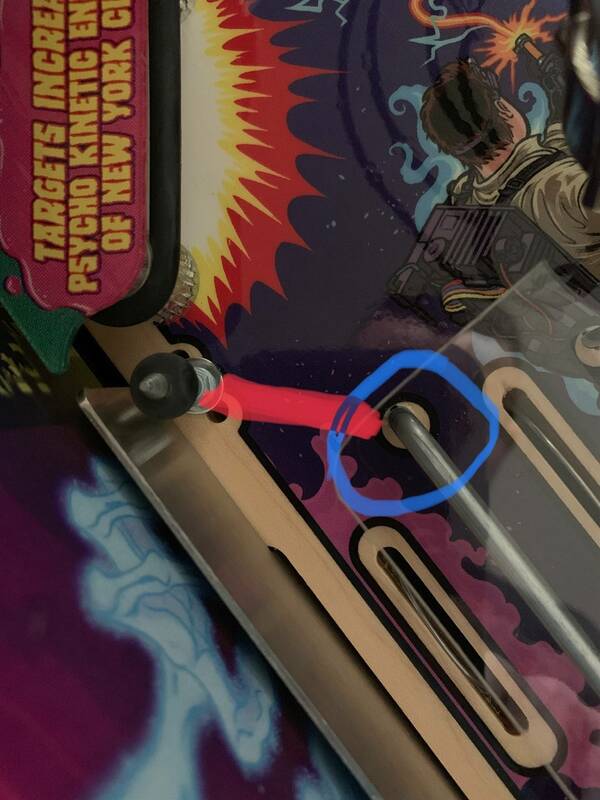 I find them to be too strong and pulled the drop target down without the ball touching it. I ended up removing about five or six coils from the factory installed springs and that worked just fine for me. For chipping at the drain trough, TZ gumdrop Cliffy works great. So something weird happened yesterday. 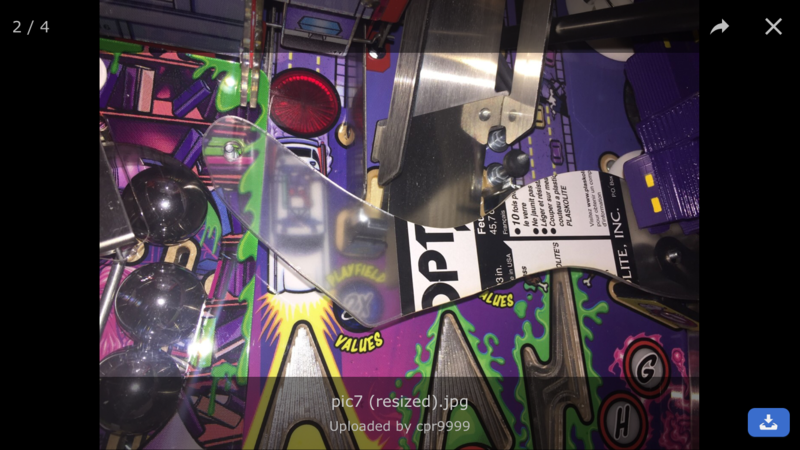 Last night I had a few games and I noticed the left flipper sometimes when I pressed it would stay up. 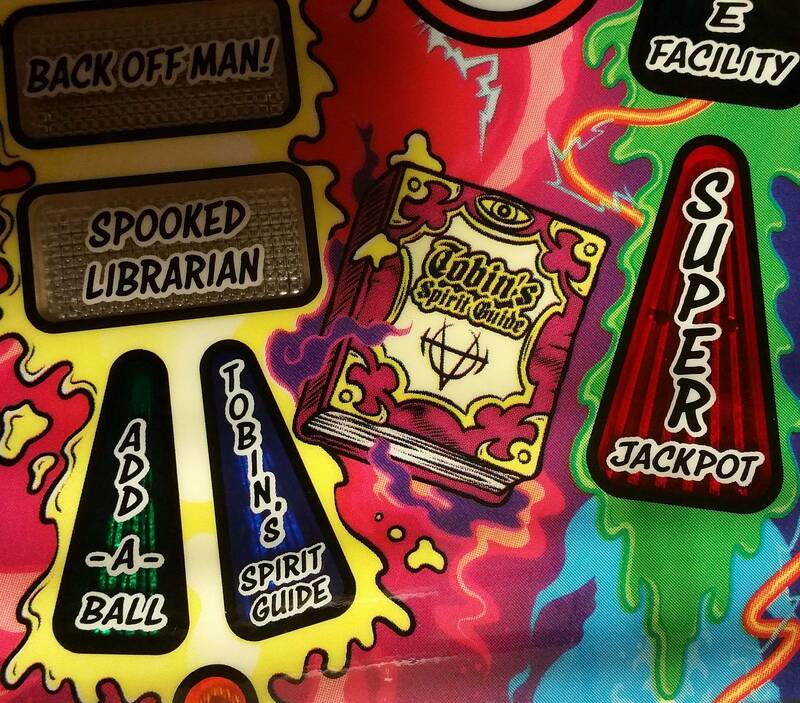 I've wondered about all the ghosting & de-laminated inserts , if the shaker is partly responsible. A lot of LE owners talk about the inserts and every LE has a shaker motor. 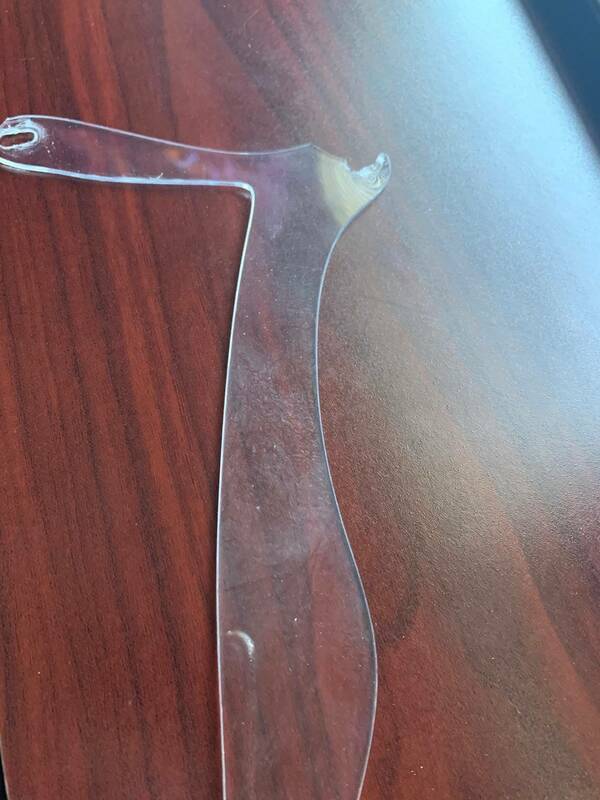 It makes sense that the shaker could rattle the inserts to the point that they crack free. Not the shaker. I've had one in my pro that has been on location since May. Thousands of plays, no ghosting at all. It is a PF issue plain and simple. Agree. I have a pro and premium with a shaker on both. No issues. Thanks for feedback everyone on the shaker. I'll continue to use it. On my Premium, Slimer rotates down and then only stays for a few seconds and then goes back up as if I had hit him. Some times I don't hit him at all but he goes back up anyway. 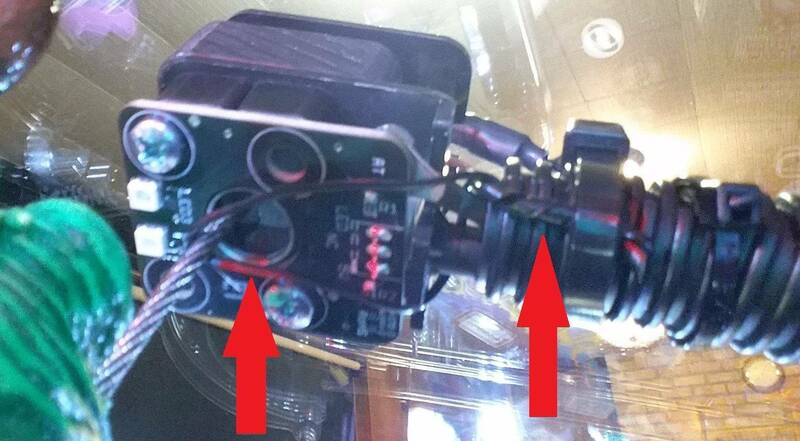 I tested the switch and it seems really sensitive jiggling 2-3 switch closes wile rotating. 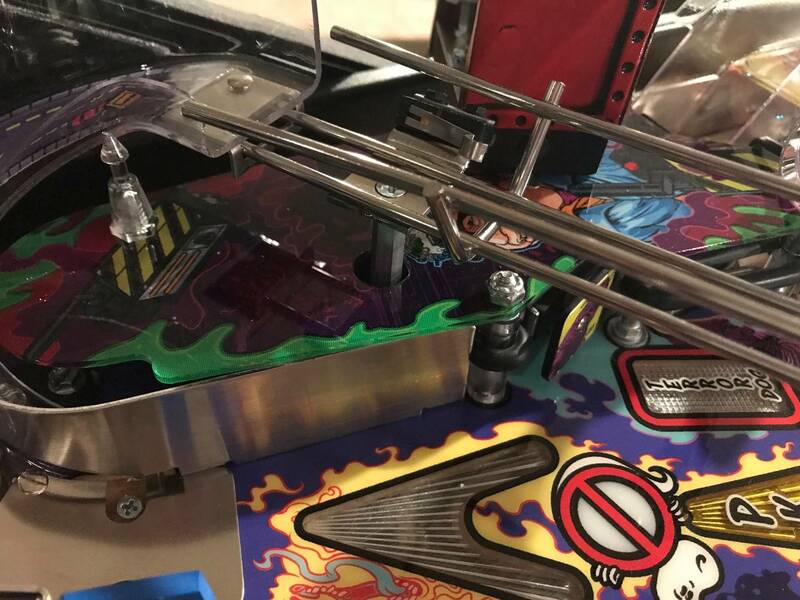 I'm still on 1.05 and I know 1.10 suppresses slimer hits while coming into the playfield. Has anyone else seen this behavior? My Slimer is too sensitive, but no fix found yet. I need to figure this. Slimer is registering hits on himself and then going back up. 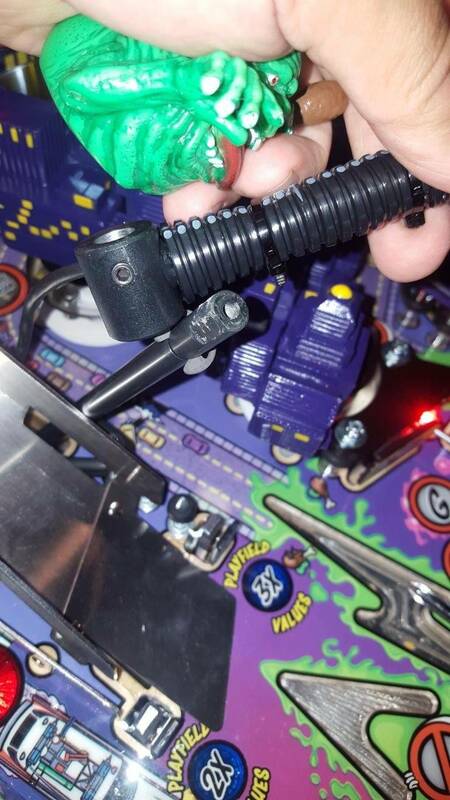 ..Does anyone have an overly sensitive newer Slimer mech that they were able to adjust? 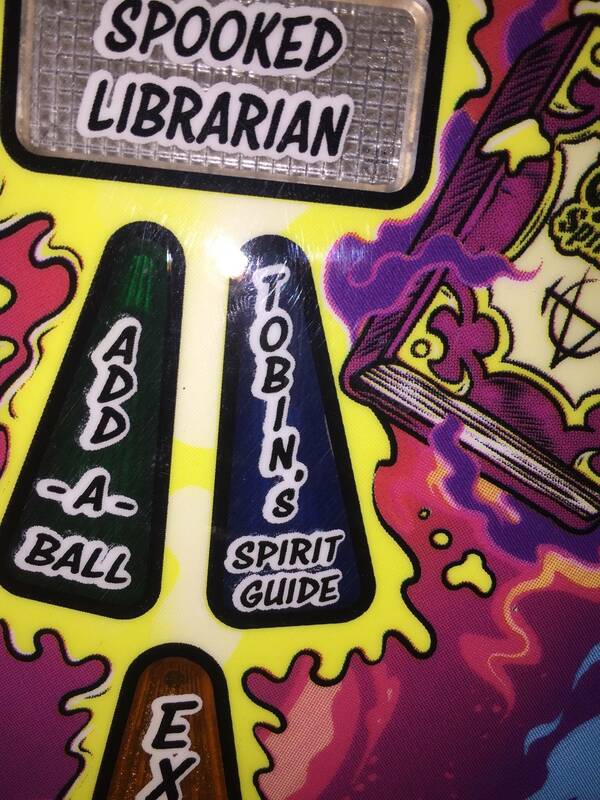 Well my tobins has an ever so small sliver of ghosting☹️. Did everyone contact stern right away or do I wait to see if it gets worse. Has anyone been told anything? Is that a premium or LE ? I'm not contacting stern yet but the fact that it started makes me nervous. I was more wondering if anyone else just got a little then it stopped or is the beginning of a landslide. After the stories I've heard, I just shoot the boys gently and they go down. a direct power hit bounces off. The new spring causes machine gunning or premature dropping for no reason. I've gotten pretty good at knocking them down followed by the phrase "Two in the box, ready to go, we be fast, they be slow" . From what I've seen, unfortunately it's the beginning Mike. It probably will progress. Don't contact Stern yet. Needs to get a lot worse on multiple inserts before you can take you shot and contact them. Just play the heck out of the game and keep monitoring. What have you tried? Mine was pretty sensitive but adjusted just fine. 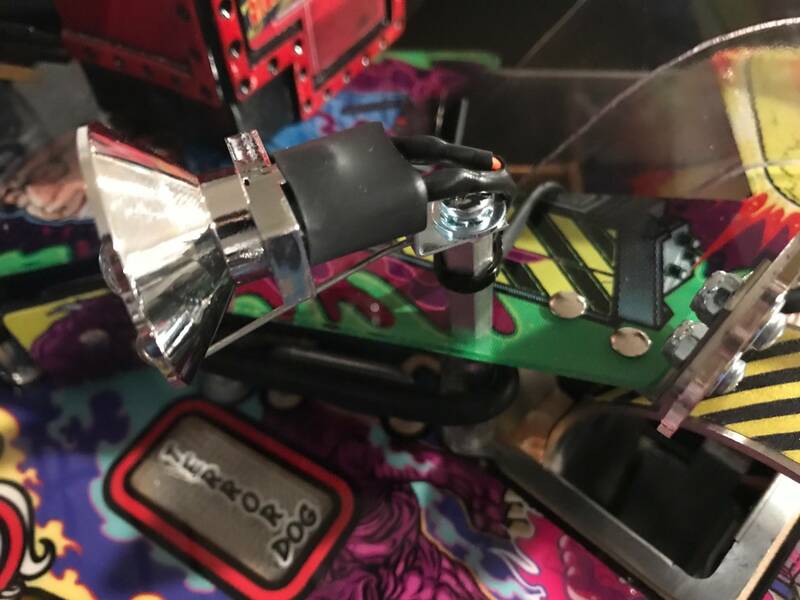 In slimer test mode hitting it would register multiple hits as it rocked back and forth. 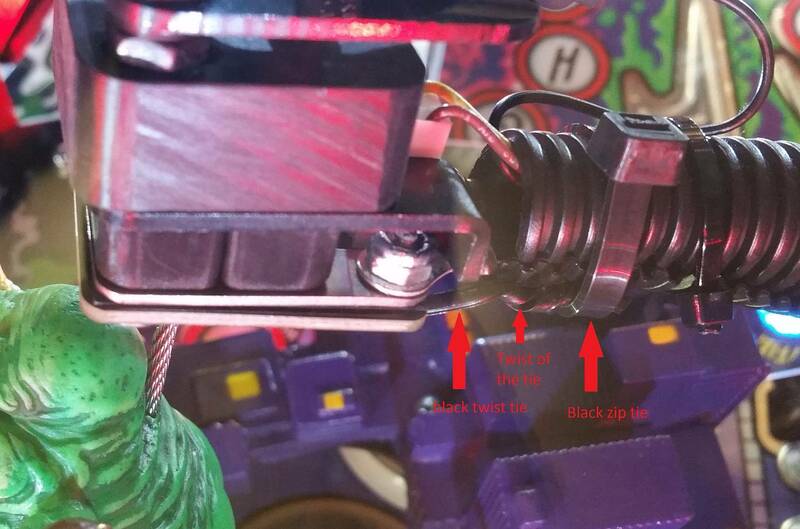 iirc all you have to do is take the top plate off the slimer mech, loosen the two nuts under that, and slightly move the plastic block on the front in or our a mm or so. Tighten, test, re-adjust until you get it right. Ran some tests & tried re-adjusting the parts, but adjusting did not help. 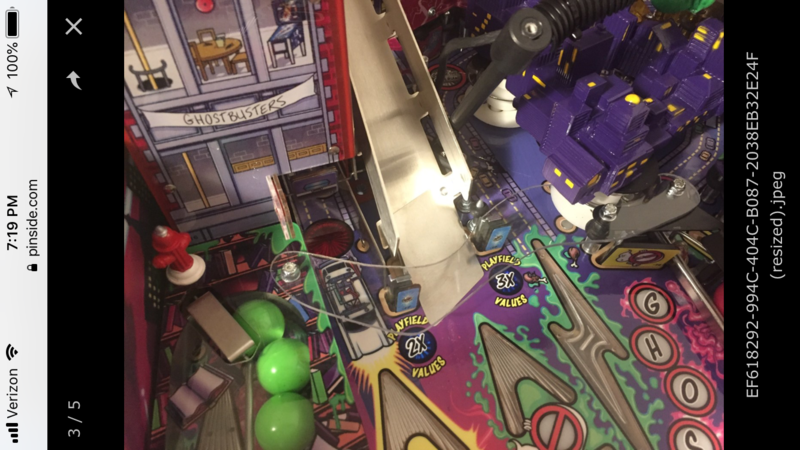 Using a black twist tie looped around the steel cable and then zip-tied under the swinging shaft to lock it down , tamed the "Slimer false hits". Fixed it. The twist tie is a loop and only corrals the swinging nature of Slimer. Now it requires a hit to make contact. Now Slimer consistently comes down & stays down until he's wacked 2 or 3 times then goes back up. There's a sound effect when a hit is registered (squish!) . Thanks Paul, I was trying this and it only seemed to make it worse but I think I'll try again. I need to get the steel cable away from the front edge of the contact ring . It seemed to get closer however I move it. Alright. If it helps, I just took a look at mine and the large plastic block is further back than yours, about 1/2 mm in behind the metal bracket. That should move everything on slimer back a bit. Does anyone have ghosting that occurred and then basically stopped at a certain point? How long has it been since it started and hasn't progressed? Or does this always get worse? Thanks Paul. I've got it adjusted now.